A proctored exam is an exam that is supervised by an approved, neutral person (a proctor) who ensures the identity of the test taker and the integrity of the test taking environment. StraighterLine requires proctoring on all final exams and uses an online proctoring service called ProctorU. ProctorU connects your computer and webcam to their website while the exam is being proctored. Proctoring sessions are taken in the comfort of the student's home (or preferred location) and require a webcam. StraighterLine final exams are the only assessment in our courses that must be scheduled in advance. You should schedule your proctored final exam at least 72 hours in advance of your desired exam day. Proctoring is available 24 hours a day, 7 days a week. Expedited scheduling is also available for an additional fee. To schedule your proctoring session, follow the steps below. For more detailed instructions, you can follow this step-by-step tutorial. To schedule proctoring, you must have your browser pop-up blocker disabled for straighterline.com. Check your browser settings and try to click to schedule again. You will need a working webcam, microphone and speakers to take your proctored exam. Most laptops already have them built-in. If your laptop doesn't, you can borrow a friend or family member's computer for a few hours to take the exam. Otherwise one can be purchased for only a few dollars through sites like Amazon or at a local Wal*Mart. Please reach out to a Student Advisor for further assistance with obtaining a webcam for the exam. Download Secure Browser: The exams require the use of a secure delivery browser. The Secure Browser is a small download that does not require administration rights to use and install, and is used for the secure delivery of computer based tests. This software does not transfer any information from your machine, nor is it resident in memory when you are not delivering a test. If you do not already have a Secure Browser installed, please use the links below to download a version for your operating system. Secure Your Exam Area: Find a well-lit, quiet and private room to take the exam and make sure that only the appropriate exam materials are present. The lighting of your room must be daylight quality and overhead lighting is preferred. You should avoid any locations where other people would be passing thru the testing area. Having other people in the testing area may invalidate your exam. Collect Two Forms of ID: You are required to present two forms of original (no photo copies), valid (unexpired) IDs: one primary ID (a government-issued ID with your name, recent recognizable photo and signature) and one secondary ID (with at least a name and signature, or name and recent recognizable photo). Visit the CompTIA Candidate ID Policy page for a complete list of acceptable identification and the full CompTIA ID policy. 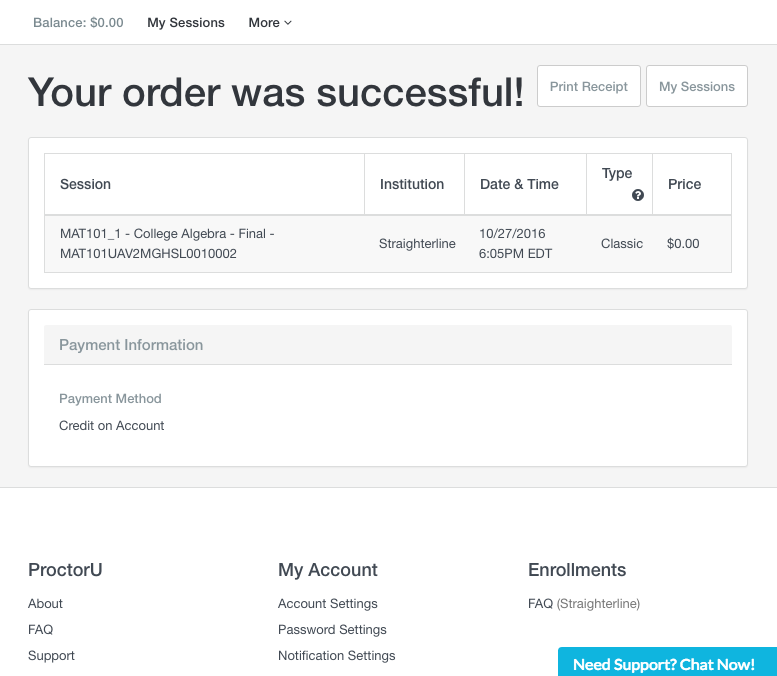 Start Your Proctoring Session: To start your session, click the “Start Proctoring” link on the back of your course card in your MyLine Dashboard. This will open up ProctorU in a new window. If you login to your session early, a countdown will display until the start of your session. Request for Access: Once your proctor connects to the session, they will introduce themselves and ask you to allow remote desktop control. Scan of the Room: Your proctor will ask that you show him or her the room you are sitting in by scanning the room with your webcam. A proctor is required to view all areas of the room, including behind the computer. If you are unable to move the laptop or camera in a way that displays the full test area, the proctor may request that you use a mirror to show the areas that cannot be viewed using the camera. They will instruct you to remove any items in the room that are not permitted materials. Open the Final Exam: Your Final Exam is typically located in the last Topic of your course. Your proctor will assist you through this process. Password Protected: All Final Exams are password protected. Your proctor will provide the exam password. Attempts: Unless otherwise noted, you have one (1) attempt only for the final exam. Timed: Your final exam is timed. The timer will not start until the exam has been opened by either you or your proctor. You should not close the exam window while your exam is running (unless you're finished and want to submit it). If time expires, the exam will submit automatically. Time limits for final exams vary by course. Question Display: Only one (1) question will be displayed at a time. End of Exam Information: At the end of your final exam, once you've submitted your answers, your score will display on the screen. 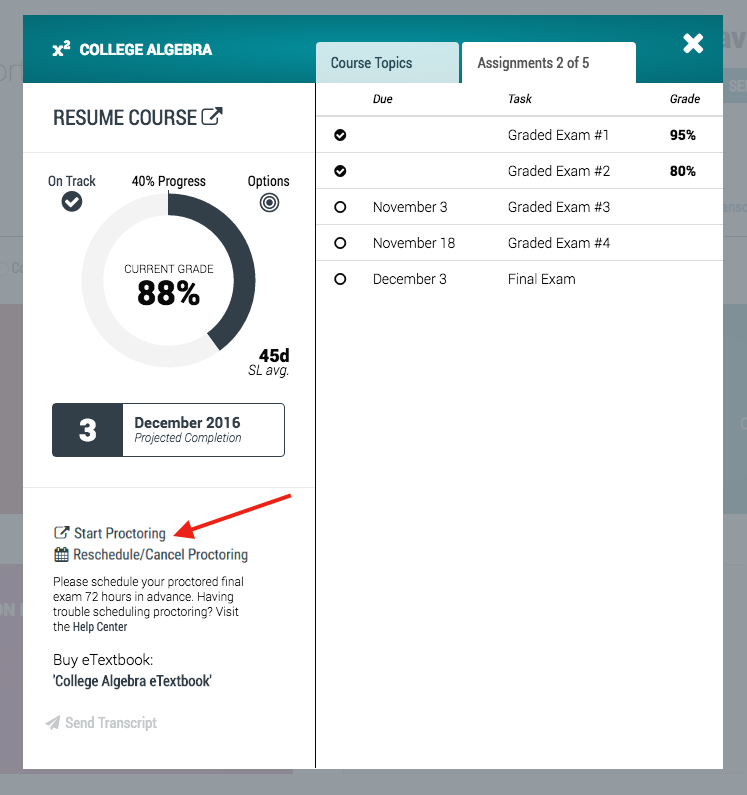 Your exam score will also be available on the back of your course card on your MyLine Dashboard. Questions during the exam? 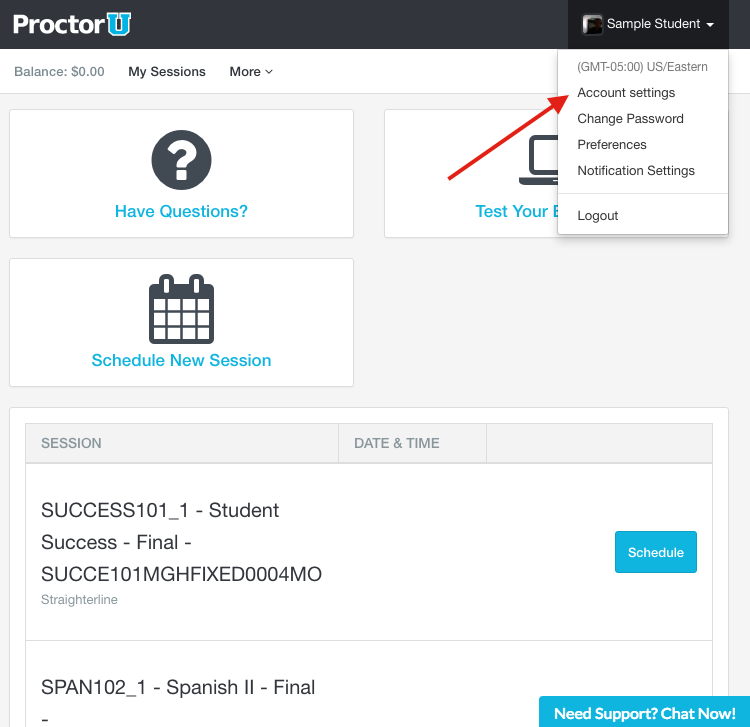 If you need help for any reason during the exam, simply notify the proctor via the chat box. Technical Difficulties during the exam? 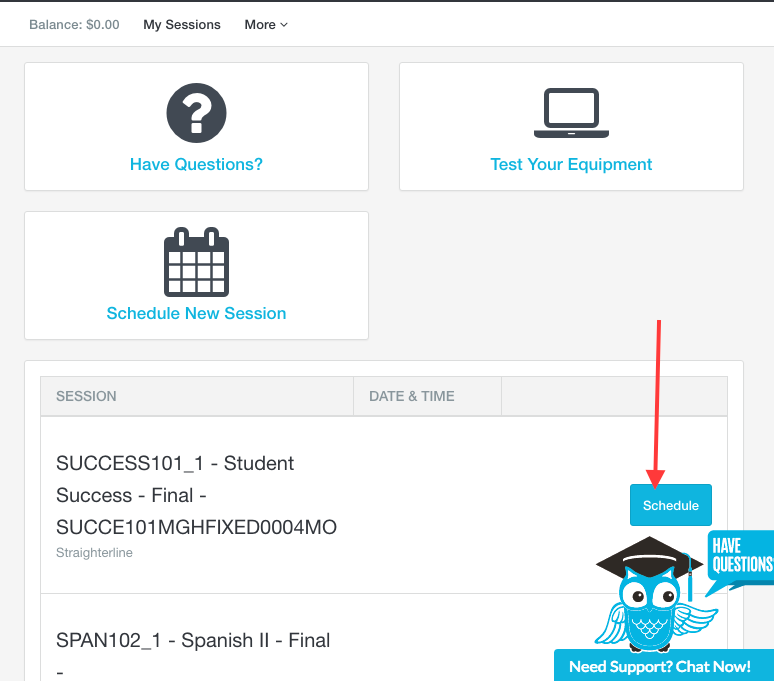 If you experience technical difficulties during your exam, your proctor will assist you via the chat function in your session. If you get disconnected for any reason, your proctor will attempt to contact you via phone. If you still experience issues, please contact ProctorU directly at 855-772-8678 or via Chat at https://test-it-out.proctoru.com/. Can the Proctor Access My Personal Files? No. ProctorU cannot access your computer files without your knowledge. With your permission, proctors have the ability to view the screen and utilize the mouse and keyboard as if they were sitting next to you. Once the exam starts, the proctor will monitor everything on the computer screen, but can no longer utilize the your mouse and keyboard. 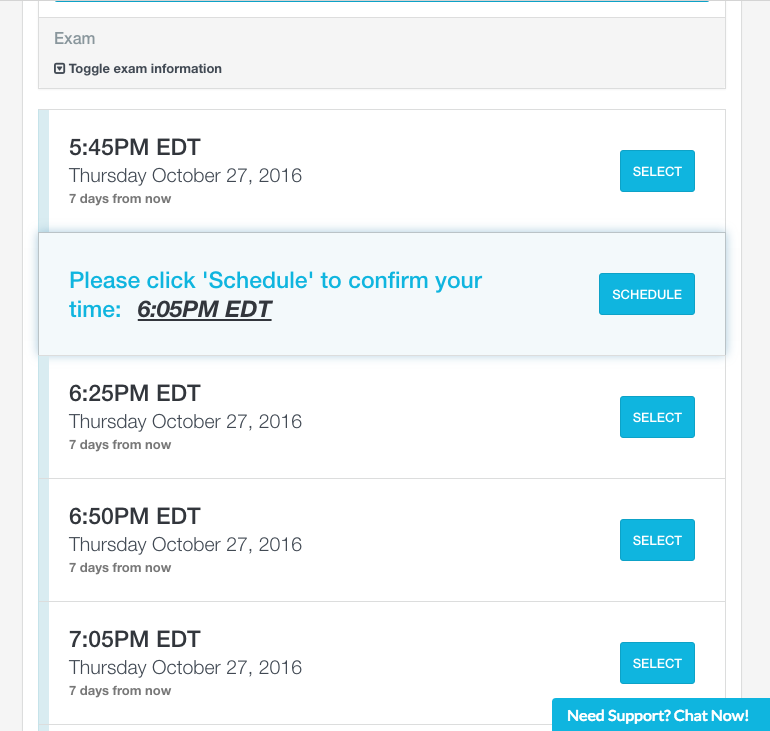 During the entire process, a chat box is running on your computer, and you can see what permissions the proctor currently has at any time. 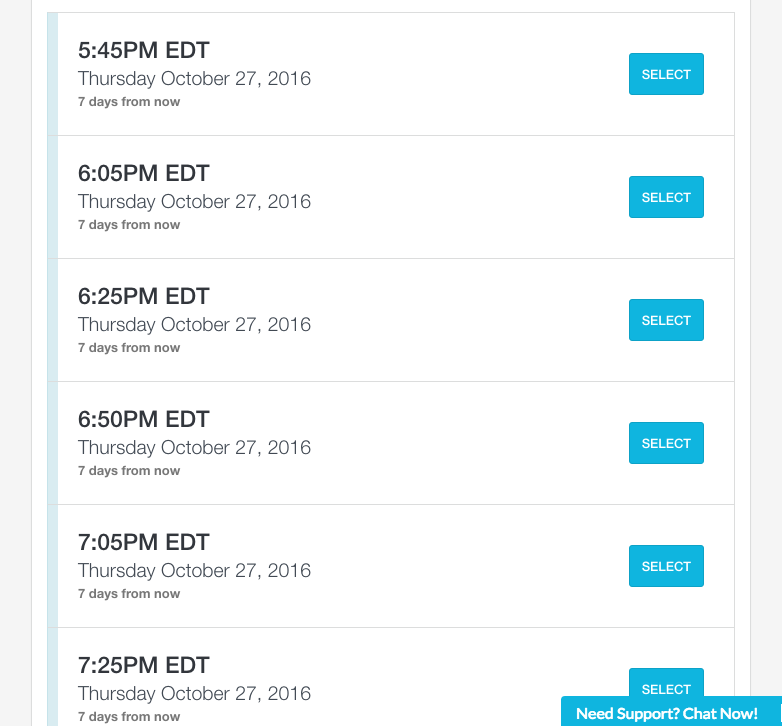 The entire chat session log is saved, including a permanent record of what actions the proctor took while accessing your computer. If you wish to cancel or reschedule your exam, you must do so at least 24 hours prior to your scheduled appointment. To cancel or change your scheduled proctored exam click the “Reschedule/Cancel Proctoring” link from the back of your course card on your MyLine Dashboard and follow the instructions with ProctorU. Cancelling an exam less than 24 hours prior to your appointment or missing your exam may result in forfeiting your exam fees. There is no fee for proctoring sessions scheduled 72 hours in advance. For expedited proctoring, ProctorU has a small fee: Exams scheduled within the 72 hour window are subject to a $8 fee, while those scheduled for "Same Day" scheduling (within 75 minutes) are subject to an $12 fee. Fees for proctoring are paid directly to ProctorU through their website during the scheduling process. Several courses, such as English Composition I and Lab Sciences, do not have final exams, so there's no need for proctoring. To ensure academic integrity, written work for such courses is subject to review via plagiarism detection software and other protocols. Questions? Please contact our Student Advisors at (877) 787-8375 , Live Chat or create a Support Request. Student Support Hours: Monday - Friday, 8:00am-8:00pm, Saturday - Sunday, 9:30am - 5:00pm EST. 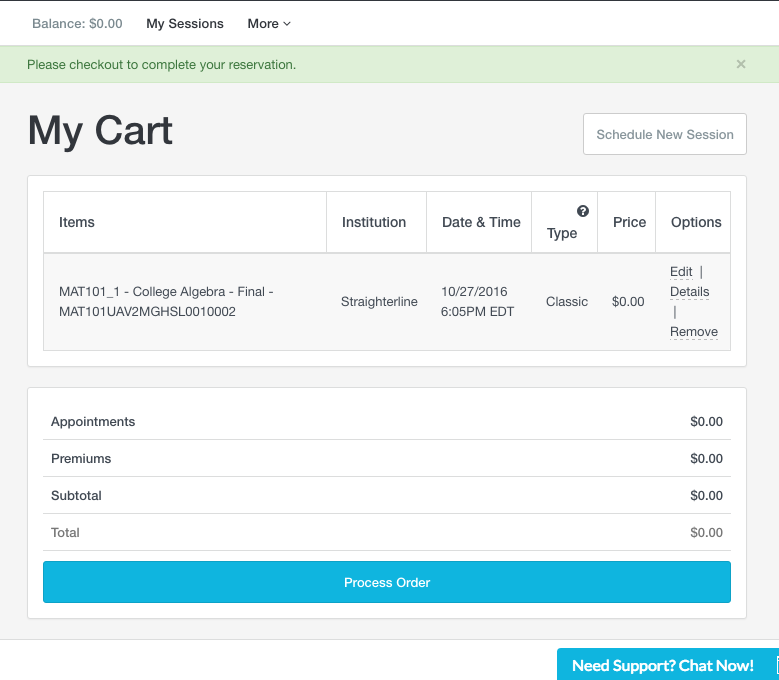 Login to your MyLine Dashboard and click the center of the course card for the exam you wish to schedule. Click "Schedule Proctoring" on the back of the course card. Navigate back to "Home" and Click the "Schedule" button next to the course you wish to schedule proctoring for. Select your preferred date and time for your exam and click “Find Available Times." ProctorU will provide available times to select from. 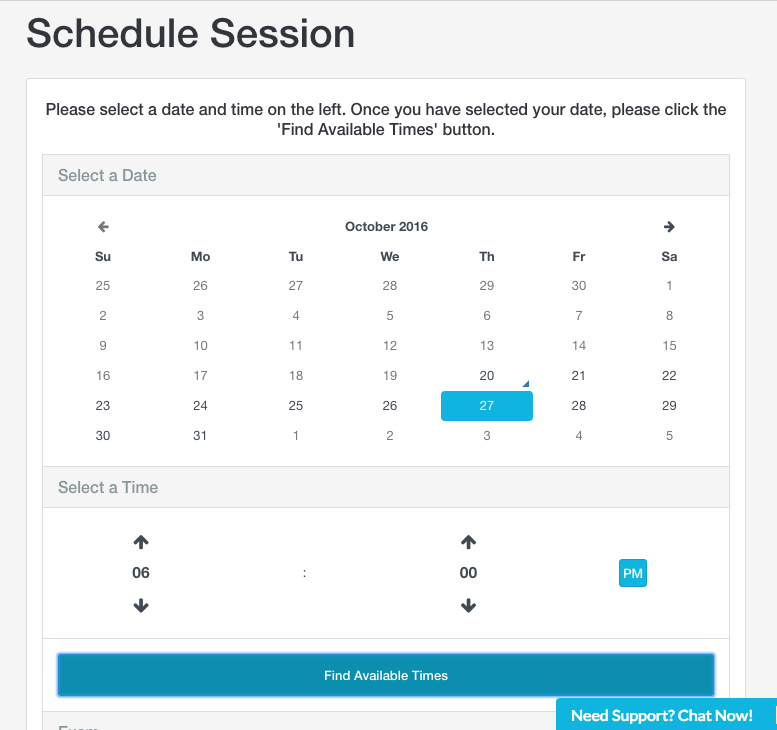 Click “SELECT” for the time slot you would like to schedule. Click “SCHEDULE” to confirm, or select a different time. The session will add to your cart (there is no fee for sessions scheduled 72 hours in advance). 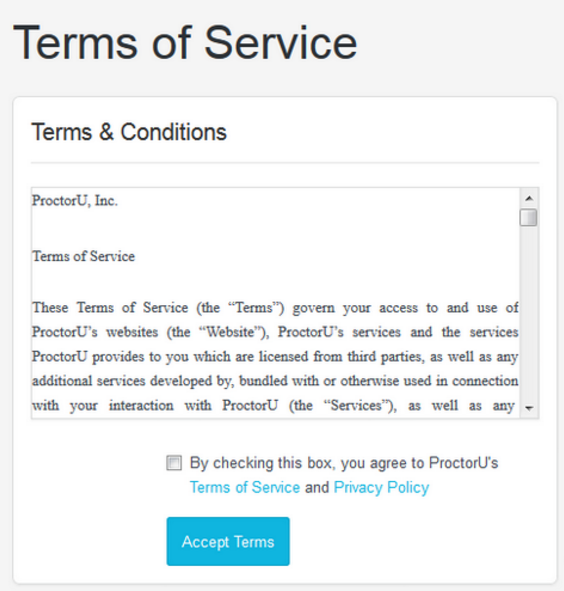 ProctorU charges a small fee for expedited scheduling. Click “Process Order” to proceed, entering in your credit card information if needed. You will get a confirmation screen once the session is scheduled. You have successfully completed the scheduling of your exam and will receive an email notification with your registration information. 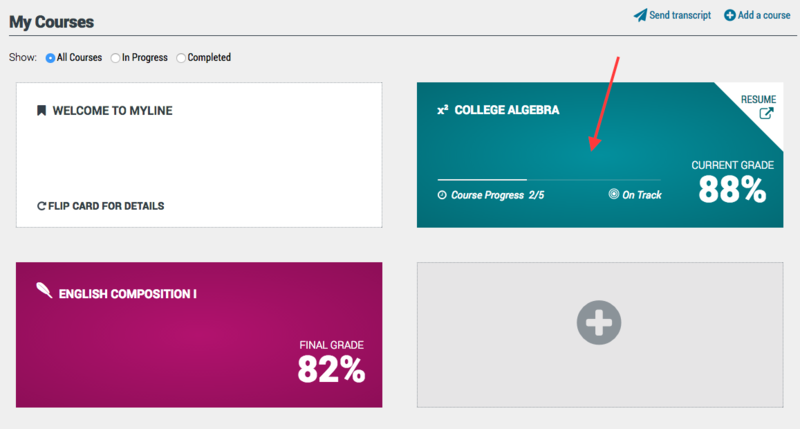 Login to your MyLine Dashboard and click the center of the course card for the exam you wish to access. Click the “Start Session” button. 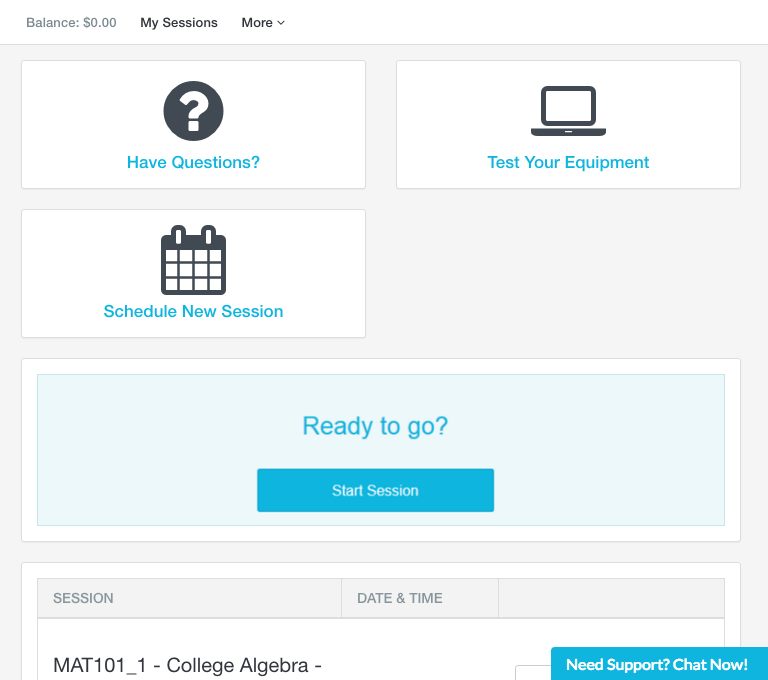 If you are a little early, you will see a countdown to the exact time of your session.You will now be launched into your proctoring session and your proctor will walk you through the steps to start your exam. Navigate to the Account Settings page by Clicking your Name at the top of the page. 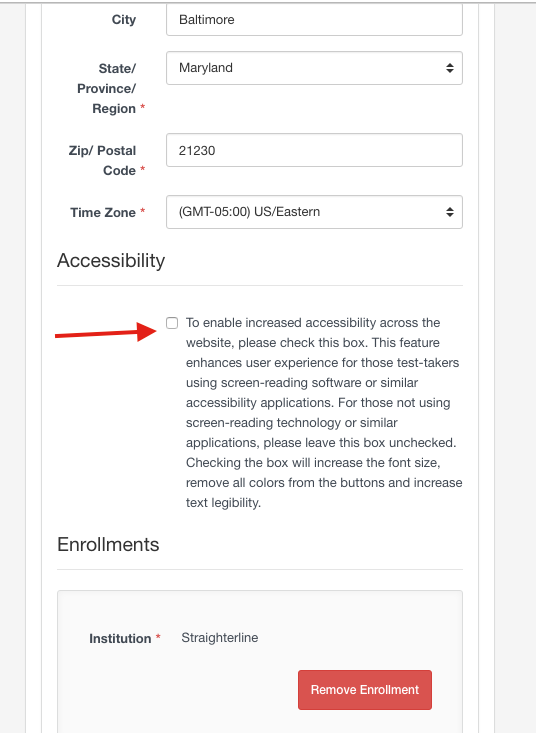 On the Account Settings page, scroll down and check the box under “Accessibility” and click “Update Account” at the bottom of the page.